We teach in a time of assessment overload. I feel like half of the time spent in school, especially this beginning month, is spent assessing. My son, also a third grader, was just telling me that he always has tests: math, reading, spelling, writing. So, in an effort to see what our students have learned in order to inform our instruction and take as little time as possible, we use sticky notes. At the end of our math mini-lesson we give the kids one or two problems they answer on stickies and we collect. 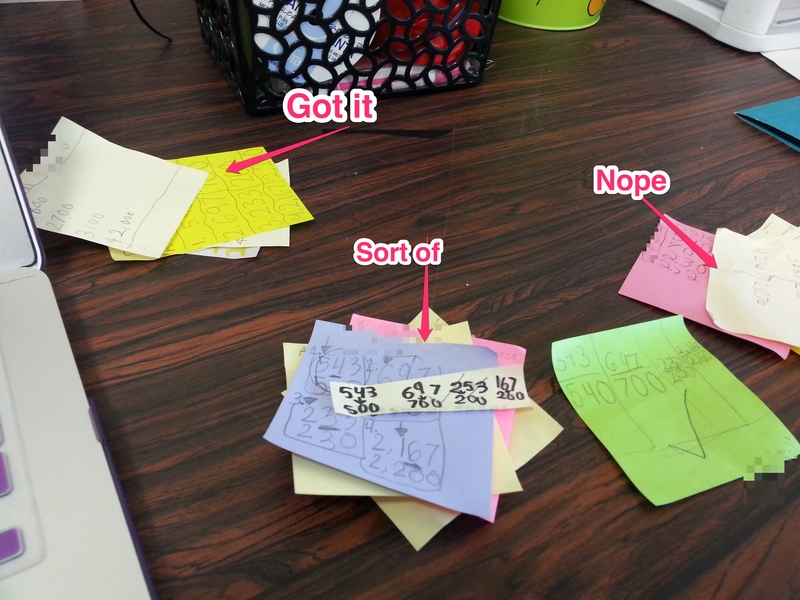 As students move to their math rotations we sort the stickies into three categories: got it, sort of, not at all. Then one of us (I co-teach) takes the “sort of” pile and the other takes the “nope” pile. As students work in workstations we pull kids to reteach or reinforce the mini-lesson. It just takes a minute or two and then we can target the students who need help, without reteaching students that already get it. As you can see from the size of the “got it” pile, rounding was hard this week. 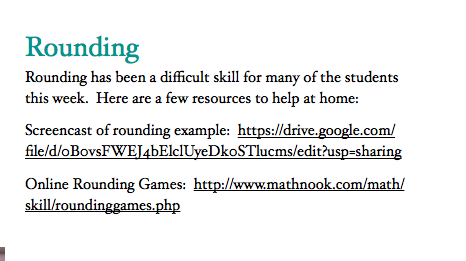 I made a screen-cast of a rounding practice problem and included a link to it and some rounding games in our biweekly newsletter to parents. Thank you for your fall temperatures! I am loving sitting here on the couch, windows open, covered with a blanket. I have been sleeping so fabulously because of you. (6:30 last night to 10:30 this morning!) Maybe I’ll even wear boots tomorrow?! I am really enjoying my second year of implementing writing workshop and your Units of Study in our third grade room. After graduating from college and student teaching I didn’t feel prepared to teach writing, but the more time I spend teaching from your units, the stronger I feel as a writing instructor. Reading the students’ personal narratives really helps me get to know them. Thank you so much for your guidance. I know I have called you a Big Blogging Bully, and I stand by my words, but I mean it in a very positive way. 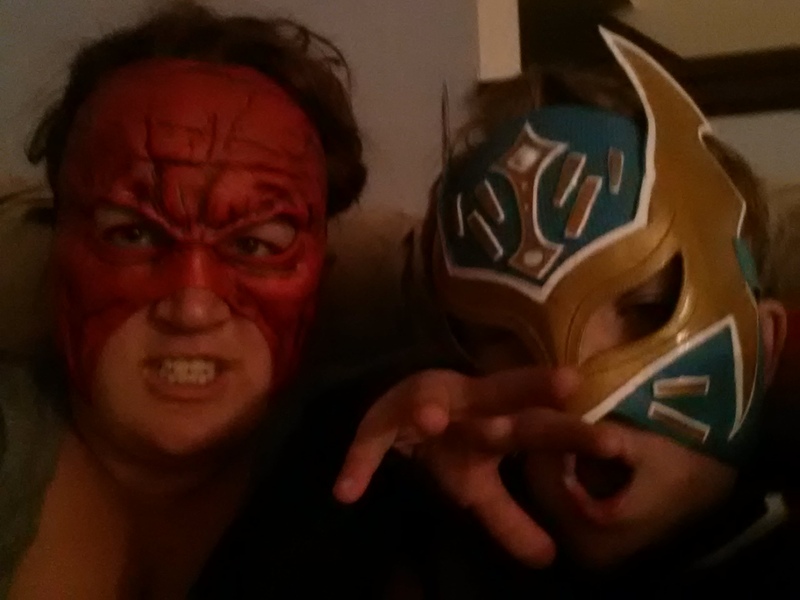 I may have been hesitant to start blogging, but you pushed me to do it and now I love it. Becoming a writer has helped me as a writing teacher as well as being just plain enjoyable. 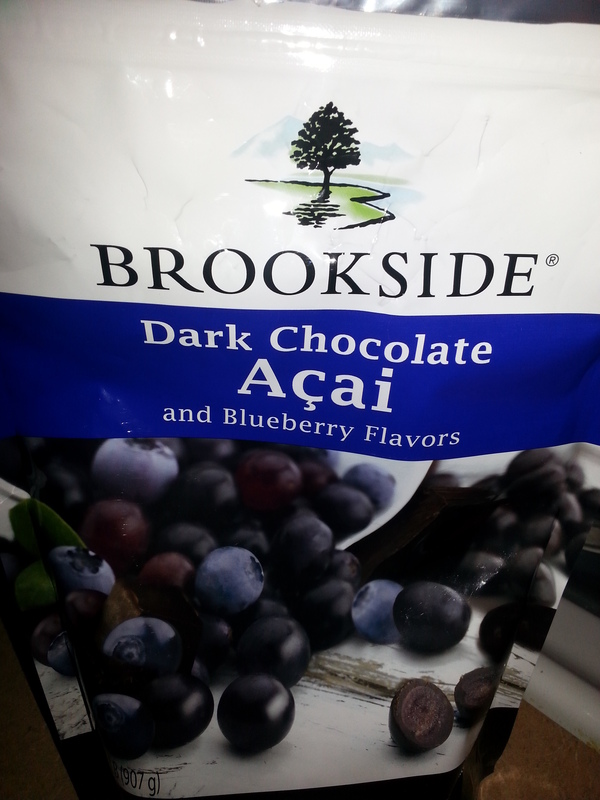 Well, out of the many things I love in this world, two of them are goofing around with my son and these Dark Chocolate Acai and Blueberry things from Costco. What about you? P.S. 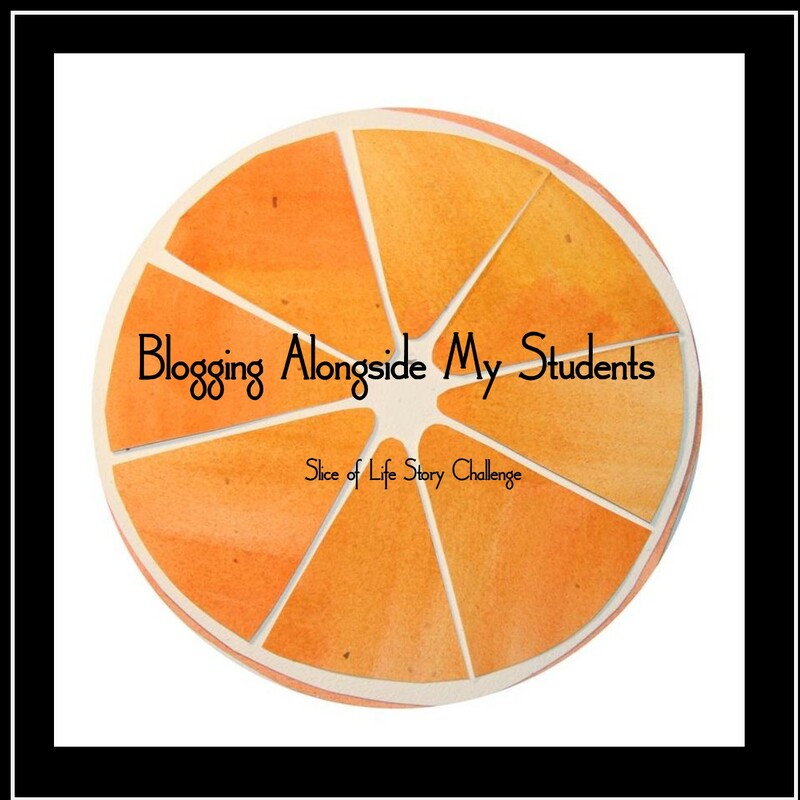 Thank you Michelle for being a Big Blogging Bully! I love you for it! Why do you always kill off one of your characters? That isn’t exactly what I needed this morning, but I should have known better. 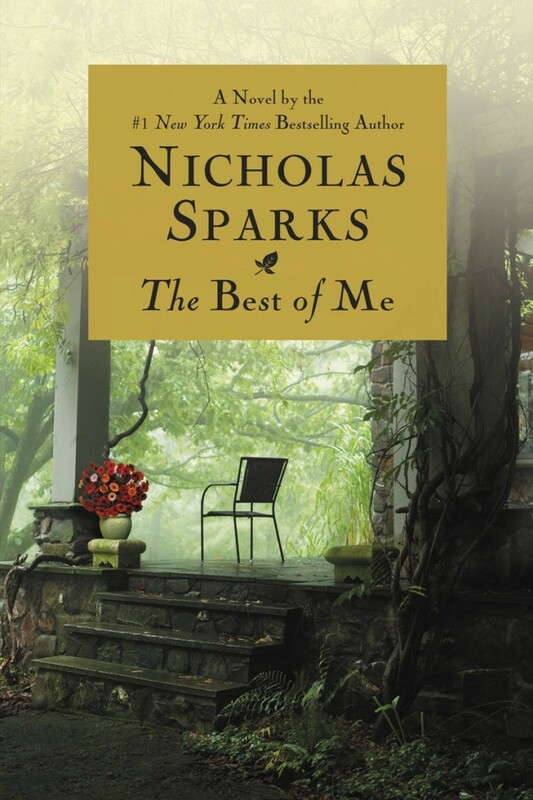 I have been listening to The Best of Me for the past few days. At first I saw a lot of similarities to The Notebook: star crossed teen love, pretentious parents, letting go to come back together later in life. Eventually I stopped thinking of the similarities, but why does death of a character need to be in every book. But, I guess the better question is, why do I keep reading your books when I know it will end with me crying?! How did you know that I am short? When JennieB was taken, you gave me “shortJennieB” as an alternative. How did you know? Why did you not wake up to your alarm this morning? I know that you set your alarm, but it wasn’t set this morning when you woke up, LATE. Did you turn it off in your sleep? Whatever happened…DON’T let it happen again!!! I know that this job we love is difficult. There will be days that you feel completely inadequate, ready to break down and walk out. We all have them and I can’t say that these days stop with experience. (They don’t.) But, I promise, there will also be days that you will break through walls and help turn on light bulbs. There will be days that you get emails from former students that make every day they made your head ache worth it. Work hard, don’t forget you always have room to learn, and most importantly, please don’t give up. These kids need us and you can do it.